3-In-1 Multi-Game Combo Table Just $79! Down From $149! You are here: Home / Great Deals / Christmas Deals / 3-In-1 Multi-Game Combo Table Just $79! Down From $149! Right now you can get this 3-In-1 Multi-Game Combo Table for just $79 (Reg. $149) at Walmart! Plus shipping is FREE or you may be able to get :fr; in-store pickup! The MD Sports Three-in-One Multi-Game Table (48″) makes a fun and versatile addition to your home’s game room. It includes three that are stored within removable and hinged table tops for easy storage and conversion. It’s unique design features re-enforced legs for additional durability. The 1/5″ leg levelers provides easy assembly and table leveling. 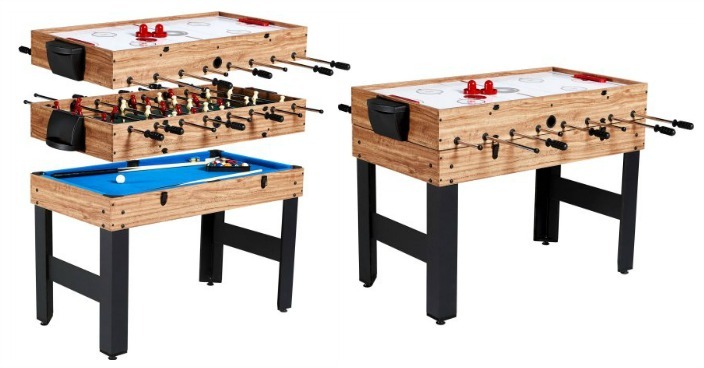 This three in one pool table includes billiards, slide hockey and soccer, as well as the necessary accessories for each activity. Play the games solo or against a friend for a competition of skills. Each one also offers an easy way to keep score. MD Sports Three-in-One Multi-Game Table (48″) is the top selling item every year, don’t miss out this year.